In December 2018, OnDeck announced its entrance into the small-ticket equipment finance lending sector focusing on the direct origination of equipment finance loans – bringing its technology and digital lending expertise to the industry on a direct basis for the first time. OnDeck, is a leading online lender to small businesses, which had been primarily focused on providing working capital loans since the company’s inception. To lead this new equipment finance business, OnDeck announced the appointment of equipment finance veteran Mark Erickson as Vice President of Equipment Finance. Erickson previously served in executive roles in sales, operations, syndications and risk at Key Equipment Finance (Key EF) where he also served as the Managing Director of the Key EF’s Australia and New Zealand subsidiary from 2000 to 2004. In January, Equipment Finance Advisor met with Mark Erickson and OnDeck Chairman and CEO Noah Breslow to learn more about this unique entrant into the equipment finance market and explore the company’s long-term strategic plans for this business. Equipment Finance Advisor: According to the recent announcement, OnDeck will remain within its traditional transaction comfort zone also in the equipment finance sector – focusing on transactions ranging from $5,000 – $150,000. 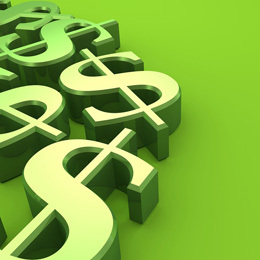 What is driving the timing of this decision to enter the equipment finance industry? 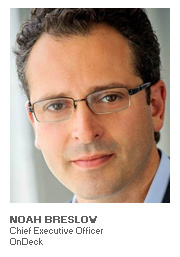 Noah Breslow: OnDeck, has been around over 11 years now and we have loaned over $10 billion since our inception. We’ve always been about scale, speed and digital lending. We pioneered the term loan product 10 years ago and introduced a line of credit product about five years ago. Our mission was to build both those products up to scale. So, today the term loan product represents about 80 percent of our portfolio, and the line of credit side comprises roughly 20 percent. But we always knew that small businesses needed a variety of financing solutions, and we didn’t have every product they require. As for the timing, we felt both that both the line of credit and the term loan products were getting more mature; and we feel very good about the credit performance of the portfolio, our financing sources for these products and our customers’ experience. Equipment financing is a product many of our customers use and we have a lot of data that suggests customers that are already working with OnDeck, would be best served if we also offered equipment finance loans. During OnDeck’s earnings conference calls, we’ve talked about other products our clients use that we don’t offer. Equipment financing is one, and others include invoice factoring, SBA loans and small-business credit cards. Over time, it’s not crazy to think OnDeck will add more of these products as well. Equipment Finance Advisor: OnDeck has been referring equipment finance business to a third party since 2018. Are there any circumstances under which you will continue to refer equipment finance business to this existing, or any other third parties, upon the launch of your own equipment finance unit? For example, deals over $150,000? 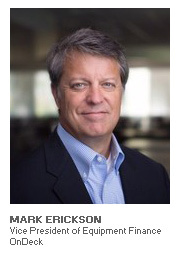 Mark Erickson: We are just entering the market. We had a pilot program in 2018 and we think it was relatively successful. We learned a lot in our research in that pilot. 2019 is really our full-scale launch of the equipment finance product. We will open with a product that is between $5,000 and $150,000. Ultimately, our long-term roadmap is to increase the top end of that range. But for 2019, it is up to $150,000. To answer your question, I think ultimately our roadmap does include syndicating or referring transactions that are either too large for us for us to consider under our current offering and/or exposure limits. We will create a network of referral partners, and that’s to come on our roadmap. Ultimately, we want to take care of our client base. Equipment Finance Advisor: Will OnDeck be working directly with borrowers, or will you also be pursuing the development of vendor finance programs in specific industries? Erickson: Our long-term roadmap does include launching vendor finance programs, but I would say that is a mid-term project on our roadmap. Our principal goal for 2019 is offering our product, as I described it, to our existing client base as well as new small business owners who are seeking the equipment finance product. We need to refine our offering and deliver a compelling solution to our current client base, and then ultimately move into vendor programs. Equipment Finance Advisor: As a follow-up, will OnDeck focus on offering stand-alone equipment financing to small businesses, or is the goal to offer both equipment financing and working capital financing as a comprehensive financing offering? Erickson: From my perspective, we are the leading digital online small business lender and, ultimately, we want to deliver whatever financial solution that meets the customer’s needs. If that is purely working capital, we think we can solve that requirement. If it is purely equipment finance, we can solve that requirement. If the customer needs both, we want to deliver whatever solution that makes the most sense for our customers. So, it’s ala carte here and we’ll provide a tailored solution that meets each client’s needs. Breslow: Mark is absolutely correct. It’s about what the customer wants ultimately. One pattern we’ve seen a lot over the years is the pairing of working capital and equipment finance. One example that comes to mind is a doctor who buys an X-ray machine and uses an equipment finance loan to finance the equipment. But then they have soft costs that go along with the installation and deployment of that X-ray machine such as electrical, repainting the office, wiring, etc. So that’s where the OnDeck working capital product has been used historically. I believe it is very powerful for the customer if you can fill out one loan application that covers both the X-ray machine, and the required working capital financing, and getting that entire financing request turned around in a few days. That is a very unique offering in the market. The bundling will definitely differentiate us given the other products we can provide. Equipment Finance Advisor: Will you be building out a separate equipment finance team or is this expansion part of the algorithm-based technology that you are using today? Breslow: The analytics and the data we have collected over 10 years of lending absolutely will be brought to bear on equipment finance. So, I would say OnDeck’s underwriting scoring process will be adapted for this specific product, and obviously the value of the equipment and a number of other items will be factored in. But we will be standing on the shoulders of all the work we have done in the working capital space for 10 years. From a team perspective, some functions will be separated because they are going to be designed and purpose-built for equipment finance and maximum speed and efficiency for that product. But there won’t be a separate technology team. We are going to be leveraging the OnDeck technology staff for the equipment finance product. Equipment Finance Advisor: Will collateral play a role in the underwriting of equipment finance transactions or will it be a credit scoring model? Erickson: Some of that answer to this question is proprietary to our model, but, in general, I would say we are first a credit lender or cash flow lender. But I would say the general class of equipment and whether it’s new or used will ultimately factor into the offer we will provide to the customer. Equipment Finance Advisor: Mark, you mentioned OnDeck will be leveraging its existing database of customers. Will OnDeck also be implementing a full marketing strategy in the future that is for the equipment finance product—to basically reach prospects beyond existing database of customers? Erickson: Again, I would say the first port of call for 2019 is to roll out the product out to our current client base, which is over 100,000 small business owners from coast to coast. We get lots of inquiries every day from our existing clients and from clients who are generally calling OnDeck looking for an equipment finance product. I don’t think we are prepared to comment on an exact marketing strategy yet. Ultimately, I think we will launch a broader marketing campaign to let the entire market know we offer an equipment finance solution. But I’m quite confident we’re going to have a huge year this year just cross-selling into our existing client base. As well as using our third-part distribution system partners, we also source business through distribution partners as well as our own direct sales force. Those groups will be marketing the equipment finance product to their clients. Breslow: To Mark’s point, between our existing distribution channels and the existing application flow and customer base, we have served over 100,000 unique small business customers over a 10-year period. So, we view that entire base as an opportunity for us. We have ample opportunity to start growing this product with customers we know and very high confidence in our existing distribution partners. Equipment Finance Advisor: OnDeck currently has partner programs with a number of banks. Is that a part of the referral program you are talking about? Breslow: That’s a little different, but worth talking about. That’s a subsidiary of OnDeck, called ODX, that sells technology into banks. Right now, the ODX product is enabling banks such as JPMorgan Chase and PNC to provide smaller working capital term loans and lines of credit. But many of the banks we are talking to about ODX’s solution also have equipment finance programs and are interested in making them more efficient and bringing them online. There is some nice interplay there between ODX and what banks want to do over time. The overall capability we have in digital origination platform can be brought to bear on the equipment finance space with banks and for our own lending business. Equipment Finance Advisor: Mark Erickson has been appointed VP of Equipment Finance, to lead the equipment finance initiative. What makes Mark the best choice for OnDeck to lead this move into the equipment finance industry? Breslow: We were very aggressive with Mark for a number of reasons. If you look at his background, he is a pretty straight forward choice and an exciting choice for us. Mark has a ton of experience in equipment financing products from his 15-year run at Key Equipment Finance in sales, underwriting and general management roles. Mark also spent some time in Australia. OnDeck actually has two international businesses; one in Canada and one in Australia. So, we expect to roll out our equipment finance product in both of those countries as well. So, Mark’s experience internationally is also important. Separately, later on in his career, Mark worked for SquareTwo Financial, which was actually an OnDeck partner for a number of years. Equipment Finance Advisor: Mark, over the past few years many small-ticket independent leasing companies have been automating their processes in order to meet customers’ rapid financing needs. How will OnDeck differentiate itself and effectively compete with these established independent equipment finance companies? Erickson: The reason I joined OnDeck about nine months ago was because I knew the company. I was working for a vendor support partner to OnDeck, as Noah indicated, so, I was familiar with the company. What I was just blown away with was two factors. One is the whole online digital experience that they provide for their term loan and line of credit customers. And, as you might have read, we launched that instant funding capability late last year, where we essentially fund the loan in the borrower’s bank account literally minutes after executing the contract. That whole online experience was just mind-blowing to me. OnDeck also has some amazing fraud technology that really expedites all the standard fraud checks that must be considered in equipment finance. And, as Noah indicated, the analytics here are spectacular. The ability to render a credit decision and put forth a loan offer in a matter of hours is spectacular. I thought if we could deliver all that to small business owners for equipment finance loans, we’ve really got something special. I fully acknowledge there are a lot of other small business equipment finance lenders and lessors in the market that are doing some really impressive things, but I haven’t seen anybody that has put the whole package together like we will. Equipment Finance Advisor: Are you looking for a strong performance in 2019? Breslow: We have been growing ahead of our expectations with very sound credit quality. You know with lending, you can grow as fast as you want if you forget about credit quality. So, for us, it is about responsible growth. Our outlook for 2019 is strong. Demand is strong for loans and our credit performance has been strong. Small business optimism was at historic highs early in 2018. It has come down a bit, but still on a relative basis, compared to other points in the economic cycle, confidence remains high, so we think all those ingredients point to a pretty good year ahead.